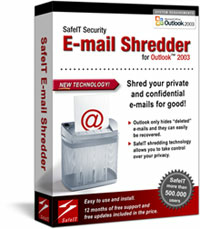 SafeIT E-mail Shredder permanently remove old e-mails in Outlook 2003. SafeIT E-mail Shredder for Outlook 2003 is a software application for permanently removing (shredding) old and deleted e-mails from your Outlook Personal Storage (.PST) file. Selected e-mails will be shredded along with all the unused space in your PST-file. This includes discarded e-mails, fragments of previously deleted e-mails and old attachments. The product is completely integrated in Microsoft Office and will enhance the way you work with Microsoft Outlook. When you use Microsoft Outlook your e-mails are automatically and consistently duplicated, left behind and hidden away. An e-mail can exist up to eight times in your PST-file and traces of old discarded e-mails can exist from the time you first created your Outlook file. In Microsoft Outlook; when you delete an e-mail, empty the ?Deleted Items? folder, or even compress the PST-file, the information is NOT removed from your computer. These commands only alter the structure of the PST-file, leaving most of the data intact and recoverable with software tools easily available. This means that someone else can recreate old e-mails that you thought you have already deleted. SafeIT E-mail Shredder for Outlook 2003 will permanently remove an e-mail by overwriting its content a number of times with pre-defined data patterns. This will make recovery impossible, even with advanced software and hardware analysis tools. Because Microsoft Outlook creates multiple duplicates of a single e-mail simply shredding the selected e-mail is not enough. Therefore, when you select a single e-mail, all the unused space of your PST-file will be shredded. This is done to ensure that every trace of the e-mail is permanently removed - even the small fragments that are commonly scattered all through the PST-file. SafeIT E-mail Shredder currently supports 11 different algorithms ranging from 1 run up to 35 runs. This includes HMG Infosec Standard 5 (Baseline and Enhanced), DOD 5220.22-M and Peter Gutmann's algorithm.